Physicists aren’t often reprimanded for using risqué humour in their academic writings, but in 1991 that is exactly what happened to the cosmologist Andrei Linde at Stanford University. He had submitted a draft article entitled Hard Art of the Universe Creation to the journal Nuclear Physics B. In it, he outlined the possibility of creating a universe in a laboratory: a whole new cosmos that might one day evolve its own stars, planets and intelligent life. Near the end, Linde made a seemingly flippant suggestion that our Universe itself might have been knocked together by an alien ‘physicist hacker’. The paper’s referees objected to this ‘dirty joke’; religious people might be offended that scientists were aiming to steal the feat of universe-making out of the hands of God, they worried. Linde changed the paper’s title and abstract but held firm over the line that our Universe could have been made by an alien scientist. ‘I am not so sure that this is just a joke,’ he told me. Fast-forward a quarter of a century, and the notion of universe-making – or ‘cosmogenesis’ as I dub it – seems less comical than ever. I’ve travelled the world talking to physicists who take the concept seriously, and who have even sketched out rough blueprints for how humanity might one day achieve it. Linde’s referees might have been right to be concerned, but they were asking the wrong questions. The issue is not who might be offended by cosmogenesis, but what would happen if it were truly possible. How would we handle the theological implications? What moral responsibilities would come with fallible humans taking on the role of cosmic creators? Theoretical physicists have grappled for years with related questions as part of their considerations of how our own Universe began. 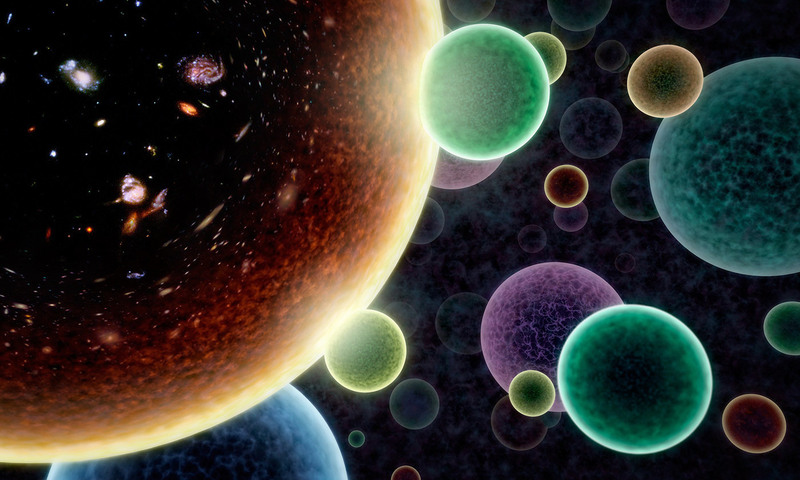 In the 1980s, the cosmologist Alex Vilenkin at Tufts University in Massachusetts came up with a mechanism through which the laws of quantum mechanics could have generated an inflating universe from a state in which there was no time, no space and no matter. There’s an established principle in quantum theory that pairs of particles can spontaneously, momentarily pop out of empty space. Vilenkin took this notion a step further, arguing [Physical Review D] that quantum rules could also enable a minuscule bubble of space itself to burst into being from nothing, with the impetus to then inflate to astronomical scales. Our cosmos could thus have been burped into being by the laws of physics alone. To Vilenkin, this result put an end to the question of what came before the Big Bang: nothing. Many cosmologists have made peace with the notion of a universe without a prime mover, divine or otherwise. At the other end of the philosophical spectrum, I met with Don Page, a physicist and evangelical Christian at the University of Alberta in Canada, noted for his early collaboration with Stephen Hawking [Physical Review D] on the nature of black holes. To Page, the salient point is that God created the Universe ex nihilo – from absolutely nothing. The kind of cosmogenesis envisioned by Linde, in contrast, would require physicists to cook up their cosmos in a highly technical laboratory, using a far more powerful cousin of the Large Hadron Collider near Geneva. It would also require a seed particle called a ‘monopole’ (which is hypothesised to exist by some models of physics, but has yet to be found). The idea goes that if we could impart enough energy to a monopole, it will start to inflate. Rather than growing in size within our Universe, the expanding monopole would bend spacetime within the accelerator to create a tiny wormhole tunnel leading to a separate region of space. From within our lab we would see only the mouth of the wormhole; it would appear to us as a mini black hole, so small as to be utterly harmless. But if we could travel into that wormhole, we would pass through a gateway into a rapidly expanding baby universe that we had created. We have no reason to believe that even the most advanced physics hackers could conjure a cosmos from nothing at all, Page argues. Linde’s concept of cosmogenesis, audacious as it might be, is still fundamentally technological. Page, therefore, sees little threat to his faith. On this first issue, then, cosmogenesis would not necessarily upset existing theological views. But flipping the problem around, I started to wonder: what are the implications of humans even considering the possibility of one day making a universe that could become inhabited by intelligent life? As I discuss in my book A Big Bang in a Little Room (2017), current theory suggests that, once we have created a new universe, we would have little ability to control its evolution or the potential suffering of any of its residents. Wouldn’t that make us irresponsible and reckless deities? I posed the question to Eduardo Guendelman, a physicist at Ben Gurion University in Israel, who was one of the architects of the cosmogenesis model back in the 1980s. Today, Guendelman is engaged in research that could bring baby-universe-making within practical grasp. I was surprised to find that the moral issues did not cause him any discomfort. Guendelman likens scientists pondering their responsibility over making a baby universe to parents deciding whether or not to have children, knowing they will inevitably introduce them to a life filled with pain as well as joy. Other physicists are more wary. Nobuyuki Sakai of Yamaguchi University in Japan, one of the theorists who proposed [Phys.Rev. D] that a monopole could serve as the seed for a baby universe, admitted that cosmogenesis is a thorny issue that we should ‘worry’ about as a society in the future. But he absolved himself of any ethical concerns today. Although he is performing the calculations that could allow cosmogenesis, he notes that it will be decades before such an experiment might feasibly be realised. Ethical concerns can wait. Many of the physicists I approached were reluctant to wade into such potential philosophical quandaries. So I turned to a philosopher, Anders Sandberg at the University of Oxford, who contemplates the moral implications of creating artificial sentient life in computer simulations. He argues that the proliferation of intelligent life, regardless of form, can be taken as something that has inherent value. In that case, cosmogenesis might actually be a moral obligation. Looking back on my numerous conversations with scientists and philosophers on these issues, I’ve concluded that the editors at Nuclear Physics B did a disservice both to physics and to theology. Their little act of censorship served only to stifle an important discussion. The real danger lies in fostering an air of hostility between the two sides, leaving scientists afraid to speak honestly about the religious and ethical consequences of their work out of concerns of professional reprisal or ridicule. We will not be creating baby universes anytime soon, but scientists in all areas of research must feel able to freely articulate the implications of their work without concern for causing offence. Cosmogenesis is an extreme example that tests the principle. Parallel ethical issues are at stake in the more near-term prospects of creating artificial intelligence or developing new kinds of weapons, for instance. As Sandberg put it, although it is understandable that scientists shy away from philosophy, afraid of being thought weird for veering beyond their comfort zone, the unwanted result is that many of them keep quiet on things that really matter. As I was leaving Linde’s office at Stanford, after we’d spent a day riffing on the nature of God, the cosmos and baby universes, he pointed at my notes and commented ruefully: ‘If you want to have my reputation destroyed, I guess you have enough material.’ This sentiment was echoed by a number of the scientists I had met, whether they identified as atheists, agnostics, religious or none of the above. The irony was that if they felt able to share their thoughts with each other as openly as they had with me, they would know that they weren’t alone among their colleagues in pondering some of the biggest questions of our being.